Mr. Clifford has been with Clifford & Brown since 2003. During that time he has tried cases in state court and has represented clients before the Contractors State Licensing Board, the California Architects Board, the Bureau of Real Estate and the California Water Board. Mr. Clifford has argued before the Court of Appeal for the Fifth Appellate District of California. Mr. Clifford is admitted to the State Bar of California, the United States Court of Appeals, Ninth Circuit Court of Appeals and the United States District Courts for the Eastern District and Central District of California. 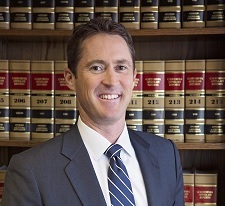 Mr. Clifford is a member of the Kern County Bar Association, the Southern California Association of Defense Counsel and the National Association of Railroad Trial Counsel (“NARTC”). Mr. Clifford’s areas of practice include business litigation, plaintiffs’ personal injury litigation, and civil defense with a focus on transportation (railroad and trucking), oil/gas and agriculture (crop loss, crop damage, chemical overspray) and legal malpractice defense. Mr. Clifford is AV rated with Martindale Hubble and received the Super Lawyers Rising Stars designation in 2013 and 2014. Mr. Clifford is the past chairman of the Bakersfield Memorial Foundation Board and a member of the Quest Club. Mr. Clifford has briefed two reported cases in the California Court of Appeal (Second and Fifth Districts): CAZA Drilling (California), Inc. v. TEG Oil & Gas, Inc. (2006) 142 Cal.App.4th 453, and Faughn v. Perez (2006) 145 Cal.App.4th 592.